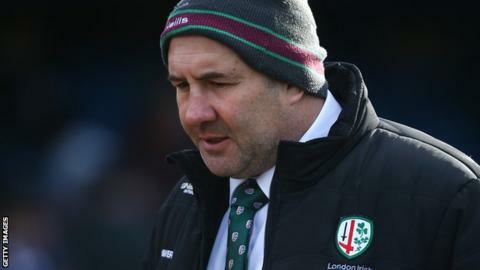 London Irish head coach Tom Coventry admits he does not know how many wins his side will need from their last five games to secure Premiership survival. "I predict probably three to four," he told BBC Sport. "But, who knows?" Irish closed the gap to five points on second-from-bottom Newcastle with a 23-18 win against Gloucester on Sunday. "It depends how the other teams get on with bonus points between now and May," Coventry added. "It's pointless looking over our shoulders at others." Tries from Halani Aulika and Blair Cowan helped Irish to a fourth win in five matches at the Madejski Stadium as their largest crowd of the season of 17,752 helped roar them to four vital points. "We've just got to manage ourselves," Coventry said. "I've said that for a long period of time. "I can't see how that be a motivating factor for us, other than we need to win." The Exiles will need to win away from home for the first time in more than a year to aid their survival bid. Their final five games start with a trip to Worcester on Saturday with a potential relegation-decider at Newcastle on 17 April.